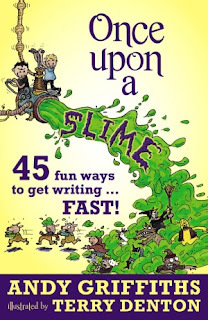 Once Upon a Slime was written by Andy Griffiths, illustrated by Terry Denton and published by Pan Macmillan (2013). - Have you ever wondered where ideas come from and how stories are made? - Would you like to know the true stories behind some of Andy and Terry's books and characters? - Are you looking for simple, practical and inspiring writing activities? - Would you like to discover 45 great ways to have fun with words and pictures? If you answered YES to any of these questions, then this is definitely the right book for you! 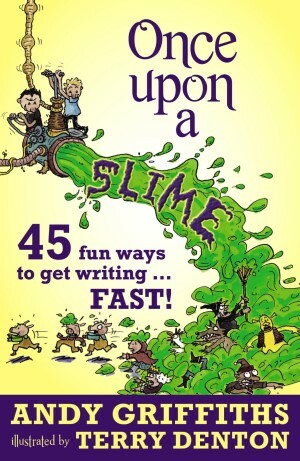 Designed for teachers, students and young aspiring writers, Once Upon a Slime contains 45 fun writing and storytelling activities, such as lists, instructions, cartoons, personal stories, poems and pocket books. Examples from Andy and Terry's books are used throughout to demonstrate techniques and to inspire readers to have as much fun playing with ideas, words and pictures as Andy and Terry do when they get together to create their crazy books. Who better for kids to learn about real writing from than a real author? Andy Griffiths is not just real, he's a household name in children's literature all over the world. But let's face it, his qualifications and reputation are not what will make kids grab this book. They will enjoy the fun, the nonsense, the visual gags, and the fantastic Denton-style cartoons. Unbeknownst to them, wedged between the tight underpants and Little Green Snotting Hood, they'll pick up excellent tips for getting started as writers. Suggestions and models like fake news articles, crazy quizzes, creating superheroes, jokes, cartoons and even a random idea generator will have kids itching to create - wonderful idea! This 350-page book makes a great gift for young writers who want to learn more about the craft of writing. Griffiths fans will appreciate the way their hero provides explanations and comments on his creative process and life. Teachers will love it too - there are so many truly fun ideas that will get their students writing. I guess the sentence that resonated with me most was this: "You don't have to be a great artist - or a great speller - to be able to have a great time with words and pictures." Encouraging kids to play with words and images is a truly worthwhile thing for we parents and teachers to do. Thank you, Andy!